But, you might ask, what does this even mean? For starters, a downstroke is when your pen moves down the page, toward your body. An upstroke is when your pen moves upward on the page, away from you. Modern calligraphy is not like black-lettering, which sharply transitions between thick and thin in hard angles. In modern calligraphy, we want our transition to be smooth, graceful, and not too sudden. I think one of the best ways to understand how to do this is to understand the “anatomy,” shall we say, of a curve. Don’t worry, I’m not about to get mathematical on you—no ‘wavelength’ or ‘amplitude’ here! For the upstroke (green), your pen moves up the page and away from you, or "north" on the page. When you start to enter the curve, your pen edges slightly to the right (blue)—moving almost sideways and up, like “northeast” on the page. There is a subtle shift in direction, but it’s there. For a split second, your pen goes to the right, or eastward, intersecting with the midpoint of the curve (red hash mark). The amount of time you stay here is almost imperceptible. Right after the midpoint of the curve, your pen starts moving both sideways and downward, or “southeast” (blue). For a balanced curve, this should be the same length as the northeast/teal first portion of the curve. Just before the midpoint, the depth tapers as your pen ceases moving true south, moves more southeast. 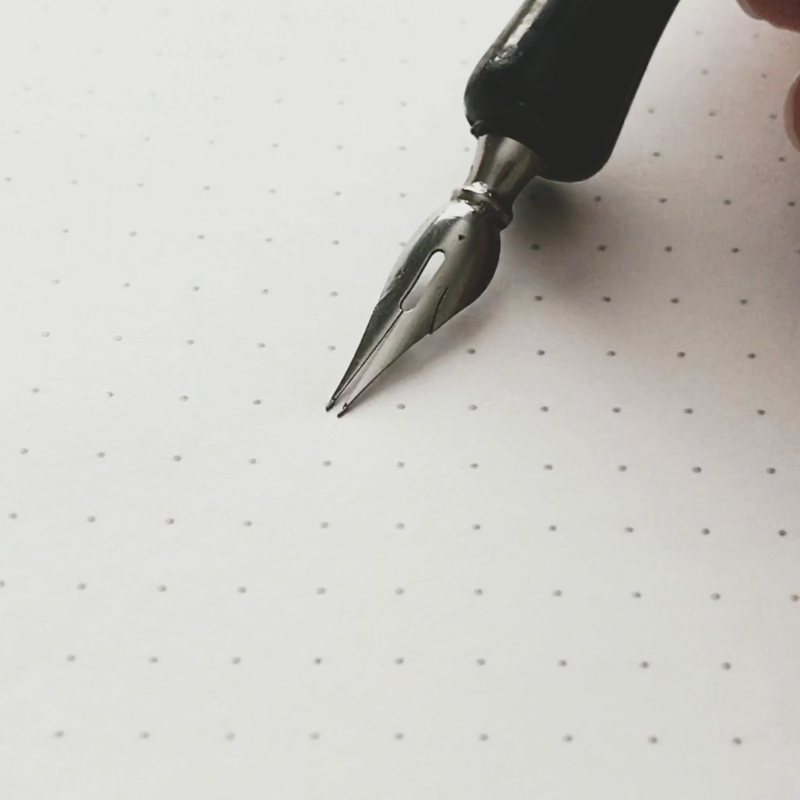 Just after the midpoint, your pen changes direction and starts moving slightly northeast as it turns and starts the upstroke. In the upstroke, your pen moves true north. The midpoint of the curve is where the upstroke and downstroke meet. However, the millimeters just before and just after the midpoint are not true upstrokes or downstrokes, and are not headed due north or due south (these are color-coded blue). This is where the thickness/depth just barely begins to build—or, when you’re transitioning out of the downstroke, where the depth begins to taper. Save for stylistic exceptions that you might make when you become a more advanced calligrapher, the thickness should be nonexistent by the time the curve reaches the midpoint. Understanding how calligraphic tools work can be an important tool in helping you create beautiful calligraphy. Having a mental concept of how these tools work helps you to build a “mental model,” a framework in your thought process about how something works in the real world. Getting acquainted with dip pen/quill and ink calligraphy helps you develop an understanding of why calligraphy works the way it does. The tip of a dip pen/quill is called a “nib.” When you use a quill, you dip the tip of the nib in the ink to fill the nib’s ink well, which in many nibs is just the U-shape that sits just underneath the shoulder. In dip pen calligraphy, thick and thin lines depend on pressure. When you write with the nib, the ink flows from the well through the slit between the two tines, which are flexible. When you apply pressure, the two flexible tines separate, allowing the ink to flow more rapidly through the slit and onto the paper (see the smaller, square images above). In this way, the tines also control the thickness of the line because the ink will naturally flow into the space between them—the more pressure applied, the further apart the tines separate, and the thicker the line. The structure of the nib actually resists thick upstrokes, almost forcing the user to create thin upstrokes. This is because the tines do not separate unless downward motion and pressure are applied to them. Moving up the page necessitates closed/neutral tines. The only way to get actually thick upstrokes would be to flip the paper upside down! This mental model takes second place for a reason; it’s not perfect, but many students of mine have found it helpful. Pretend your writing is slightly raised on your writing surface—almost like bubble paint that you use to write on fabric. 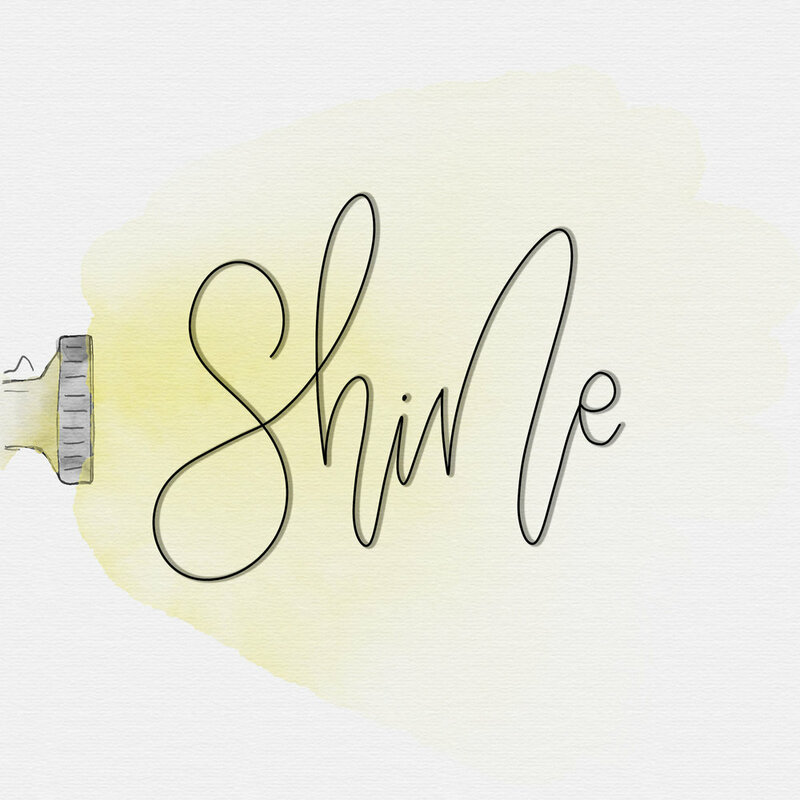 Imagine you place a really strong, harsh light directly to the left of your raised writing, shining to the right. Picture the shadows this would create. This is an imperfect metaphor because light and shadows do not discriminate between thin upstrokes and thick downstrokes, but it is helpful in visualizing the transition between thin and thick, because the shadow attaches to the curves of the writing smoothly.